From Goodreads.com: The moment she arrives in California, Deirdre falls in love with the untamed land that will become the Widows’ Winery. Despite no one in all of Sonoma county being willing to sell them materials or labor, she is determined to find a way to build their homes and the winery. She must, for if she doesn’t meet the land improvement deadline, they’ll lose their land and their dream. This pursuit keeps her in the company of Kin O’Leary, a handsome business man full of innovative ideas. But, considering how she married for money the first time—as her family dictated—she convinces herself she will only find true love in a man of lesser means. Technically, this is a stand-alone novel even though it is a part of a series, only book number two has characters that feature heavily in this story. I don't think you necessarily have to read either of the others in order to gain an understanding of the events taking place in this story, and to be perfectly honest if you have not read the prior novels, you may even enjoy this one more. That being said, I have read the first two stories in the Emerald Belles series, and I feel as though this one was just missing something. The first two were witty, romantic and surprising. And while this one had its moments, I feel like it went along at a snail's pace compared to the other two, and the satisfaction at the end was too anti-climatic. I expected more - especially when it came to the villain, Ainsworth. Added to that the somewhat predictable plot-twist that happened in regards to the widow's housing situation and well... this story just fell way short of the standards that I felt were set in the prior novels. The characters were a bit odd as well. 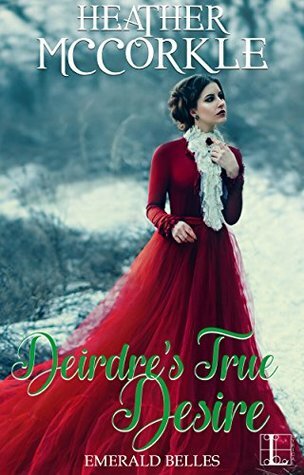 I enjoyed the fact that both Deirdre and Kinan had secrets they would rather not reveal, but I felt like Deirdre really didn't make much sense. She prided herself on being independent, and the fact that her status as a widow meant she didn't need a man, unless she wanted one of course. It also seemed as though she toyed with Dylan a lot at first, not being open and telling him outright that she was not interested. There are also the numerous times that she comes up with some harebrained scheme or idea and acts upon it - without thinking it through. We get no real reasoning behind why she does what she does, and the fact that her friends consider her a bit "wild" or "reckless" just doesn't cut it. I want to know her motivation. Why she feels driven to say the things she does and act/react the way she does. Even by the end of her story, I don't feel like we really got to know HER. Overall however, I do believe this story may still appeal to those who enjoy historical romances. I would read more from this author!